Usain Bolt is the clear favourite to win the World Championships in Berlin. 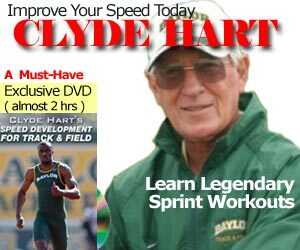 But lost in the controversy of who ran the fastest split ever recorded was Tyson Gay’s 2008 Olympic Trials 9.68 performance. Mind you, it was under a +4.1 m/s tailwind advantage. A 9.68 (+4.1) 100 meters translates to a 9.85 adjusted by Jonas Mureika web site which is mediocre for Tyson. His 9.77 in Rome was much more impressive beating Asafa Powell in the process. 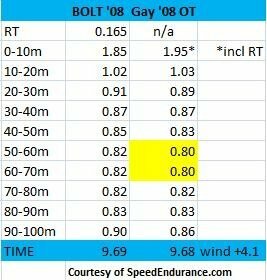 In my previous post, other sprinters recorded 10 meter splits in 0.83 where Usain Bolt ran 0.82, the fastest in history. 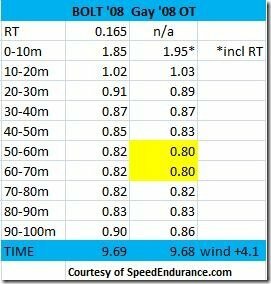 Tyson Gay’s splits from 50-70m was an astonishing 0.80 sec per 10 meters. It is an awesome demonstration of top end speed by a human being. His speed endurance is also remarkable, slowing down marginally over the last 10 meters. You can always simulate overspeed training by means of devices such as pulleys or even a slight downhill grade. Sadly, his next race was the 200 meter heats where he severely injured his hamstring which may have cost him a medal at Beijing. Whether this superhuman supra-maximal performance had anything to do with the injury is up for discussion. Unless you are one of the 8 lined up for the finals, there’s no chance to win a medal. Once you line up, anything goes. So does Tyson have a chance of beating Usain Bolt?